Meeus, Jean (1991). Astronomical Algorithm. Richmond, VA: Willman-Bell. p. 319 - 324. ISBN 0943396352. ↑ Cullen, Atronomy and Methematics in Ancient China. Cambridge, 1996. ↑ Needham, Joseph. (1986). Science and Civilization in China: Volume 5, Chemistry and Chemical Technology, Part 6, Missiles and Sieges. Cambridge University Press., reprinted Taipei: Caves Books, Ltd.(1986). Page 151. ↑ Ebrey, Patricia Buckley (1999). The Cambridge Illustrated History of China. Cambridge: Cambridge University Press. ISBN 0-521-66991-X (paperback). Pages 124-125. ↑ Asiapac Editorial. (2004). Origins of Chinese Science and Technology. Translated by Yang Liping and Y.N. Han. Singapore: Asiapac Books Pte. Ltd. ISBN 981-229-376-0, p. 132. ↑ Needham, Joseph. (1959). Science and Civilization in China: Volume 3, Mathematics and the Sciences of the Heavens and the Earth. Cambridge University Press., reprinted Taipei: Caves Books, Ltd.(1986), pp. 109–110. ↑ Ho, Peng Yoke. (2000). Li, Qi, and Shu: An Introduction to Science and Civilization in China. Mineola: Dover Publications. ISBN 0-486-41445-0. p. 105. ↑ Restivo, Sal. (1992). Mathematics in Society and History: Sociological Inquiries. Dordrecht: Kluwer Academic Publishers. ISBN 1-4020-0039-1. p. 32. ↑ 15.0 15.1 "ปฏิทินจีน พ.ศ. 2445 - 2643 Gregorian-Lunar Calendar Conversion Table 1901-2100". Hong Kong Observatory. 20 Dec 2012. สืบค้นเมื่อ 19 Feb 2015. ↑ "The Essence of the Chinese Calendar". chinesefortunecalendar.com. สืบค้นเมื่อ 19 Feb 2015. 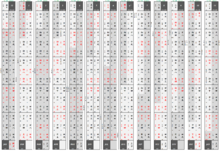 ↑ "Lunar calendar for 2018 year". lunaf.com. หน้านี้แก้ไขล่าสุดเมื่อวันที่ 3 เมษายน 2562 เวลา 08:48 น.